Select eggplant that is very firm when squeezed, and fairly narrow, which often means fewer seeds. The bitter baba you may have had now and then is attributable to the cook not removing the seeds from the eggplant before mashing it up. Do that, and you’ll have a much different baba gannouj on your plate than you would otherwise. Use at least two eggplants, since removing the seeds reduces the amount of eggplant you have left to work with. Don’t skip the pomegranate seeds if at all possible; they add beautiful color to the dip and a delicious tart flavor too. 1. Char the eggplant by poking a few holes in them with a knife or skewer (so the skin won’t burst). Cook them on a hot barbecue, a low flame on the gas burner, or under the broiler. 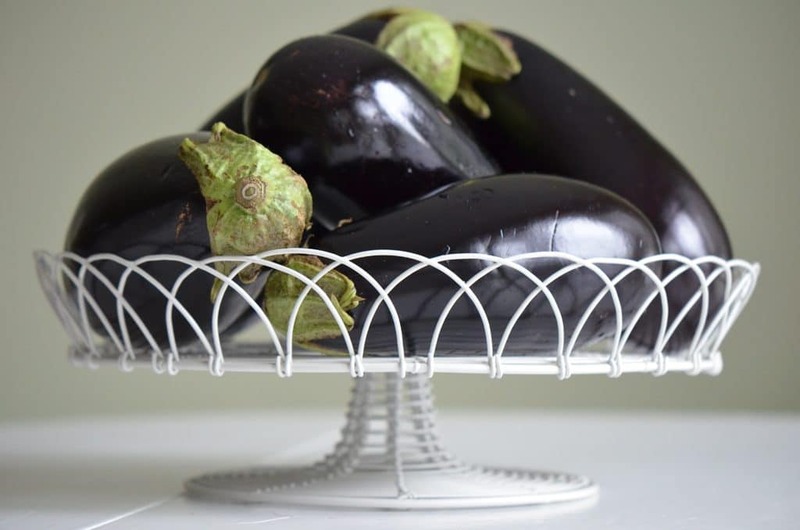 If you’re broiling the eggplant, place them on a parchment lined baking sheet a few inches under the broiler. Whatever the heat source, turn the eggplants over halfway through cooking (use tongs) to char them evenly. 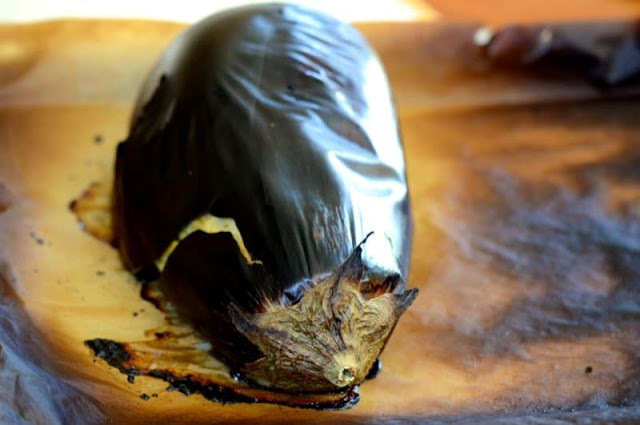 When the skin is blistered and the eggplant is very soft, remove them from the heat. Under the broiler this takes about 30 minutes. 2. When they are cool enough to handle, peel the skin off with your fingers and cut away the stem end. Open the eggplant and pull out the lines of seeds, and discard them. 3. Chop or mash the eggplant until it forms a dip-like texture. In a bowl, combine the eggplant with the tahini, salt, garlic, lemon juice, and black pepper. 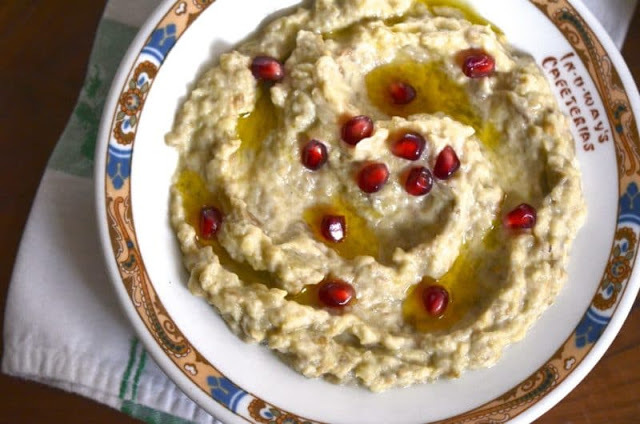 Taste and adjust the seasonings, then spoon the baba gannouj onto a plate. Make some swirls in the eggplant with the back of the spoon, and drizzle olive oil over the top. Sprinkle with pomegranate seeds, and serve with pita chips, crackers, vegetables.